Being able to exchange feedback and discuss each other&apos;s work is at the core of productive teamwork, and we want Nuclino to accommodate that in the best possible way. 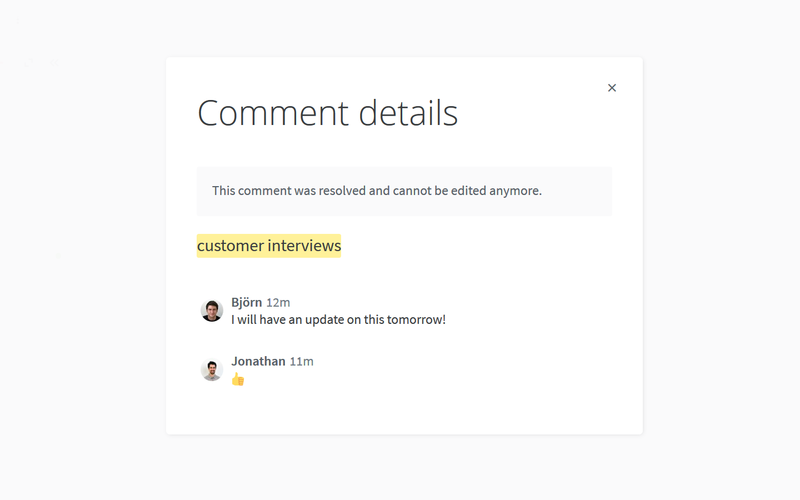 With today&apos;s update, we have revamped the entire comment and notification experience to make collaborating in Nuclino an even more social and interactive experience! Ever needed to have a discussion around the whole item rather than a specific section of text? Wanted to quickly grab someone&apos;s attention without having to mention them in the content? Had to find and check a resolved comment? We have added a brand new &apos;Activity and comments&apos; menu where you can discuss the item, mention your team members to ping them, keep track of inline comments – or simply chat! Want to get instant notifications about any new or resolved comments? Simply click "Follow" to subscribe to updates. You can also easily view resolved comments. When someone resolves an inline comment, a log entry will be added to the &apos;Activity and comments&apos; menu – simply click on it to see the content. This will apply to all comments resolved from today onward. Notifications are a great way to stay updated about all the changes and comments. But they can also be quite distracting, especially if you are involved in several active discussions. We have worked to improve the notification system in Nuclino to make them as unintrusive and helpful as possible and remove all redundant alerts. Comment notifications will now be automatically marked as read based on context, for example, if you open the comment thread directly. This way, you will only be notified about the comments you haven&apos;t yet read.